The Travel & Tourism Research Association is dedicated to helping travel professionals by offering global data and analysis on tourism, research papers, events and a community so they can network and engage with like-minded professionals in the travel industry. The previous website was very dated, lacked clear structure and call to actions and did not do a great job of offering their visitors an experience and a way to easily find the information that was available to them. The website was also not mobile friendly which limited access to important content. 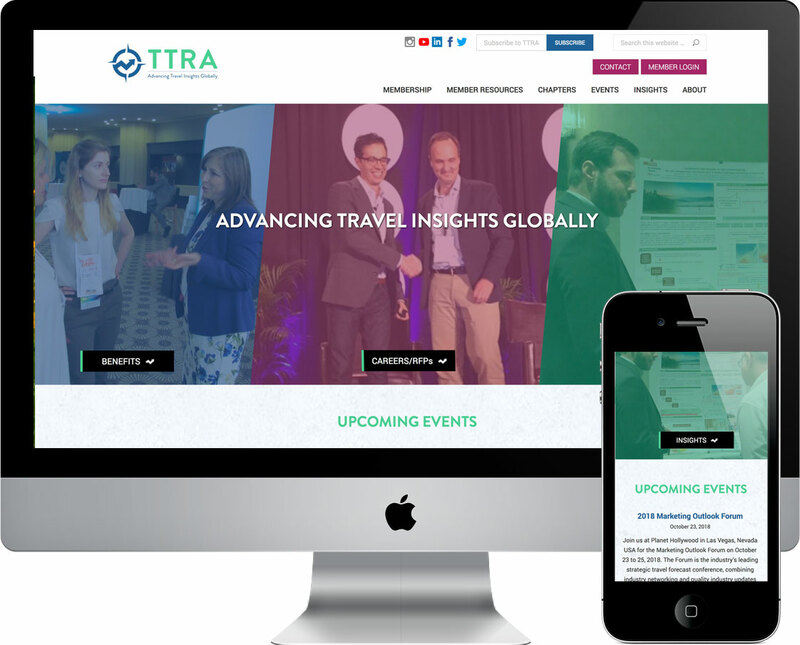 TTRA wanted a new website that was engaging, bright and allowed for a clear navigation menu and bold content areas that were easily to read. One of the important areas was their chapters that are located throughout the world - the old website did not offer a great visual of the work these chapters do or engage users to learn more about them - so this was an important component for the redesign. This was the keyword for this project! With a fully redesigned and developed website - we gave them a vibrant color scheme to go with their new logo and lots of space and features to allow them to deliver content in a variety of ways - including static, toggles and tabs. Using the Events Calendar plugin we were able to create a great event page with filtering by chapter so travel industry experts can find the events closest to them. A custom created events page was also included so the staff could customize a landing page for their annual events to include sponsorship information, hotel registration and more. All of the content is easily added via custom fields in the admin and are showcased in a simple tab style layout on the front end. This reduces page clutter and makes it easier for the TTRA team to manage. The home page features a world map with icons for each of their chapter locations with a link to the chapters specific page so visitors can see what is going on in their section of the world. Each chapter page is managed by a member of the chapter - and that person only has access to their specific pages. The pages offer tabs and toggles to deliver content and are all easily updated with our easy to use admin area. 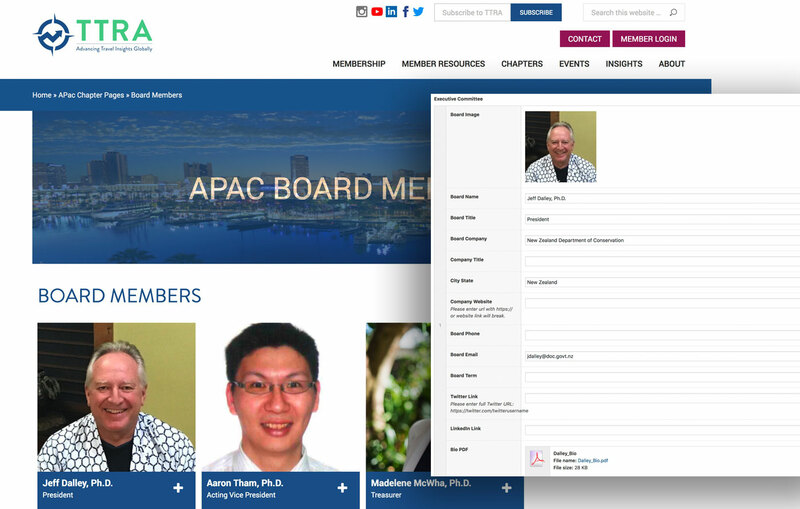 In the image below you can see the APAC Chapter Board member page on the front end and see how easy the content is added for each board member in the popup image on it. When the toggle icon is clicked, all the information in the fields like board company, board email. pdf and more will appear in the toggle area.